Use inside or outside for audiences of up to 1,500 in rooms of up to 15,000 sq. ft. Speakers can be placed up to 300 ft. apart. Easy setup and break down. 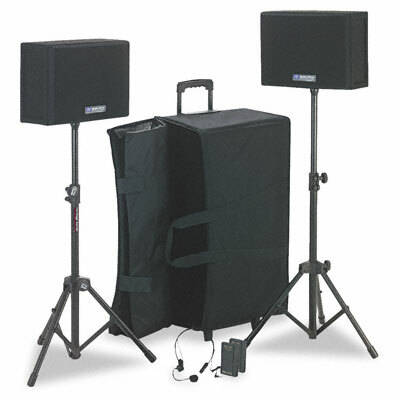 Complete wireless sound system with separate wireless powered speakers that can be placed up to 300 ft. apart with no cables to connect. Each cabinet has two built-in Jensen design speakers (4 total), a built-in receiver, 50W stereo amplifier with three mic inputs, auxiliary jack with separate volume control for CD players or computer projectors and a line out jack for recording presentations. Use inside or outside to reach audiences of up to 1,500 in rooms up to 15,000 square feet. Completely wireless design makes setup and breakdown a snap. Power source: Ten D batteries (sold separately) in each cabinet. Maximum batter operation time: 200 hours.